Our long-term efforts and international ONE STOP® services have once again received international award! For six years, Staria has been a leading provider of US-based Oracle NetSuite ERP solutions in Finland. For the third time, Oracle has now awarded Staria with NetSuite 5-Star Partner award. 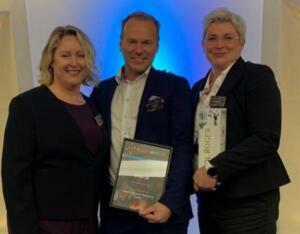 Staria was also awarded with the New Customer Revenue 2018 acknowledgement. Juha Tommila, CEO of Staria Oyj, is grateful for the recognition. “We have a really great NetSuite team and amazing customers, the thanks for these recognitions really belongs to them”, Tommila says. “Our customers are success stories in their own fields, and it is our great privilege to help them grow and find international markets”, he adds. The use of cloud-based financial and ERP systems is increasing continuously. The drivers of this growth are the internationalization of companies, the desire to find scalable solutions for their own business, and positive business results. Staria’s NetSuite and ONE STOP® service solutions are used by companies operating in a broad range of industries, such as Supercell, Wolt Enterprises, Management Events and Relex. Staria Oyj is an information system and financial services company whose mission is to enable the most efficient services and tools for its customers to use in modern business. Staria’s services include local and international information systems, financial, HR and payroll solutions, as well as specialist services and Robotic Process Automation. Staria is also the most internationally recognized NetSuite partner. Established in 2003, the company is fully owned by its employees.